Rampur (Uttar Pradesh), April 17: A police complaint has been registered against BJP leader and Union Minister Mukhtar Abbas Naqvi for referring to Samajwadi Party (SP) leader Azam Khan as "Mogambo" and thereby violating the model code of conduct. Naqvi allegedly used the name of popular Bollywood villain "Mogambo" while referring to Khan during a public rally here on Monday, in the wake of the latter's 'Khaki underwear' remark towards actor-turned-politician and his BJP opponent from Rampur Lok Sabha seat, Jaya Prada. Rampur Additional Superintendent of Police (ASP) Arun Kumar Singh said, "Based on the statement made by BJP leader Mukhtar Abbas Naqvi the magistrate who was monitoring the rally had given a complaint based on which an NCR has been registered. 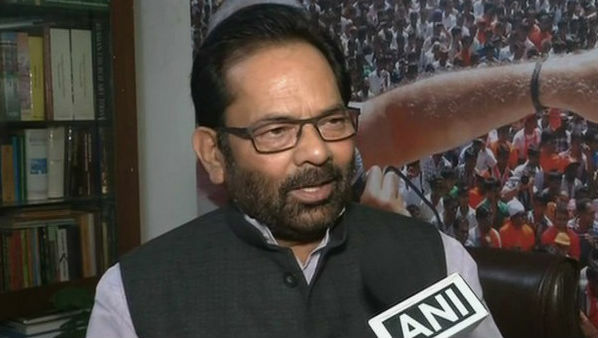 Viral Video Shows Mukhtar Abbas Naqvi Repeating 'Modi Ki Sena' Remark at Rampur Rally. "The case has been registered on the order of Magistrate M K Gupta. "On April 15 a rally was organised by BJP in which party's leader Mukhtar Abbas Naqvi referred to Samajwadi party leader Azam Khan as Mogambo. This is a statement that can cause animosity and is also a violation of the model code of conduct," Magistrate Gupta said in his complaint. The speech was made at Shahbaad Ram Leela ground in Rampur on Monday and the FIR was registered on late night on the same day.